Bare is a powerful and potent blend that combines skin transformative botanical oils and soothing plant extracts that work in harmony to strengthen and revitalize delicate complexions. Our proprietary in-house formula is designed to care for sensitive and reactive skin types. Bare features biodynamic jojoba oil to balance sebum production and provide lasting moisture. Soothing calendula targets redness as black cumin oil keeps blemishes at bay. Rich in skin beautifying nutrients and moisturizing omega fatty acids, this silky serum strengthens skin’s protective barrier with firming sterols and smoothing phospholipids. Bare feeds skin a daily dose of plant based vitamins, minerals and antioxidants to boost vitally and ignite a healthy glow. *Our certified organic, skin compatible plant oils provide the purest, most effective, and healthy form of moisture, eliminating the need for a traditional facial cream. Bare is free from essential oils, and the faint nutty scent is a gentle reminder that mother nature is present and working in full force to care for your skin. Our oils are not manipulated to remove scent or color- instead we use oils that are in their purest form, to fully preserve their inherent nutrients and antioxidant content- for the benefit of your skin. This is ultimately the product that I had been missing. My skin is loving it. My skin has not felt this soft in years. Considered an acne antidote – contains phytonutrients that target the appearance of redness, irritation and blemishes. One of nature’s most powerful anti-inflammatory oils – contains antibacterial, antihistamine and astringent properties that target blemish causing bacteria and skin irritation. With a similar composition to human sebum – allows for superior absorption, balancing oil production and delivering lasting moisture. Contains Pro-Vitamin A which has been shown to reduce the appearance of fine lines and wrinkles, even skin tone and encourage healthy cell renewal. Renown for its remarkable healing effect on skin – antibiotic, antimicrobial, antioxidant, anti-inflammatory properties reduce appearance of scarring and environmental damage. Prized wound healer and skin soother that’s been used as a medicinal herb for centuries. Contains triterpenes, polysaccharides, carotene, antiseptic and antibacterial properties, actively accelerating recovery time and reducing visible signs of redness and irritation. Premium quality oils are sourced raw, organic, unrefined and non-deodorized for maximum nutrient density. Therapeutic grade essential oils are distilled from wild medicinal plants. 18 active + skin loving ingredients are hand blended in synergistic quantities proprietary to Root Science. Tried and tested by real people to ensure optimal skin benefits. Delicate notes of sweet Pomegranate and hints of nutty Argan reunite skin with nature’s purest actives. Serum warms in the palm of your hand and nutrients are gently massaged into skin. Lavish botanicals drench complexion in glow activating vitamins as moisture rich oils quickly absorb, revealing perfectly primed skin and a new state of health. Housed in stunning dark violet glass for the highest standard in freshness and potency. Concentrated, water-free formula eliminates fillers and preservatives. Pumps instead of droppers reduce oxygen-induced rancidity. Violet glass instead of clear prevents light degradation. Purest form of organic + wild crafted ingredients are protected for skin safety and efficacy. 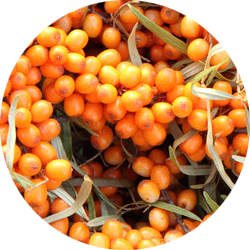 Native to both Europe and Asia, Sea Buckthorn use dates back thousands of years. It’s been recorded in Tibetan medical texts and described as the miraculous berry by ancient Greek scholars. Sea Buckthorn possesses properties that help nourish, revitalize, and restore severe skin ailments such as acne, eczema, dermatitis, skin ulcers, hyper pigmentation and severe skin damage caused by radiation. Along with its astounding healing powers it is also one of nature’s anti-aging secrets, giving skin a youthful appearance by promoting cell regeneration. 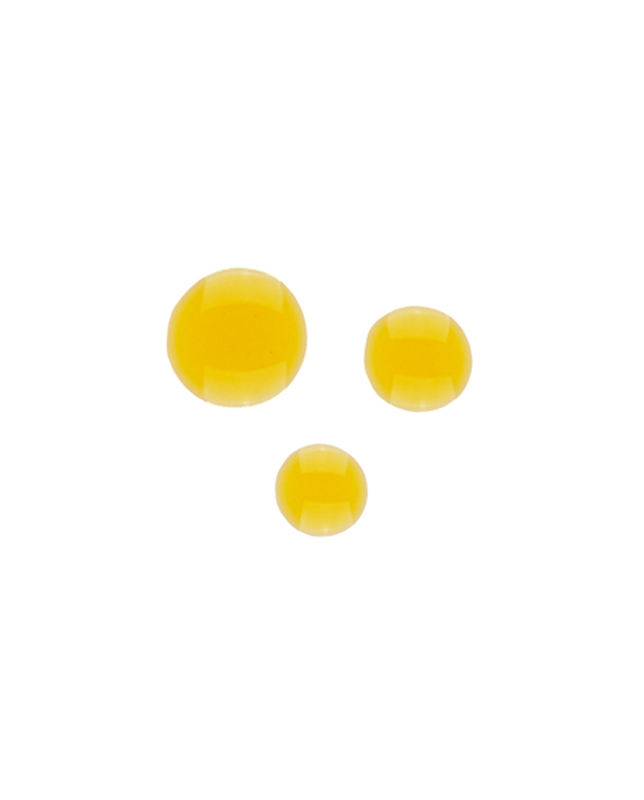 For these spectacular reasons, we use Sea Buckthorn Oil in almost all of our facial moisturizer formulas. Simmondsia Chinensis (Jojoba) Seed Oil*, Vitis Vinifera (Grape) Seed Oil*, Silybum Marianum (Milk Thistle) Seed Oil*, Camellia Oleifera (Camellia) Seed Oil*, Vaccinium Macrocarpon (Cranberry) Seed Oil*, Hippophae Rhamnoides (Sea Buckthorn) Seed Oil*, Punica Granatum (Pomegranate) Seed Oil*, Argania Spinosa (Argan) Kernel Oil*, Adansonia Digitata (Baobab) Seed Oil*, Rubus Idaeus (Red Raspberry) Seed Oil*, Nigella Sativa (Black Cumin) Seed Oil*, Calophyllum Inophyllum (Tamanu) Seed Oil*, Calendula Officinalis (Calendula) Flower Extract*, Tocopherol (Vitamin E). Great product ,it’s work for me. I love this product for daytime, as it’s not as rich as Restore, which I use at night. I have combination skin. It’s very simple but does the job of keeping my face soft. I have been using Root Science for years and my skin has never been better! During my first pregnancy, my skin changed. Bumps, rash, pimples… patchy dryness, it didn’t end! I started using Root Science’s Youth formula and it changed my skin. All my issues cleared up in just under a week and never came back. Now, I’m pregnant with my second and the same terrible skin conditions reared their ugly head. Now I’m using Bare and the pregnancy acne and rosacea is GONE- my skin looks awesome! I highly recommend these formulas for unpredictable hormonal pregnancy skin! There is nothing that compares. I first heard about this from Neiman Marcus. I purchased a bottle and was very pleased with the results. My skin looks better than it has ever looked and I have used so many expensive products including Vintner’s Daughter Facial Serum. This is a better serum and it doesn’t make me break out. I have sensitive combination skin which tend to break out in my chin area. This has completely turn my skin around. I love it. When I found your company online I ordered another bottle of this serum. You won’t be disappointed – its wonderful. Before using Root Science products, I’ve never written a review for any product at all, but I would feel remiss if I didn’t let others know how truly effective and wonderful these products are—especially this serum. I have an autoimmune condition, which means I never really know what I’m going to get any given week. 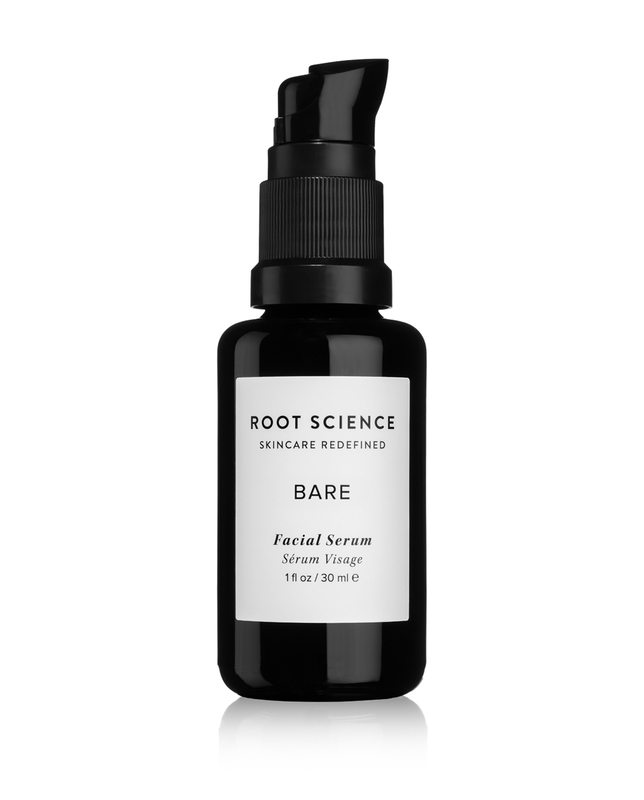 I’ve always had to have an arsenal of products to treat dryness, sensitivity, acne, large pores, and more—that is, until finding Root Science. This serum, in particular, makes my skin feel perfectly calm, soft, clear, and never oily or greasy. My skin looks extremely even and just healthy. I can’t imagine using anything else after this. Oh, and I saw results almost immediately after using for the first time. What more could you ask for? Like plant medicine for the face! It’s not highly fragranced like most serums but does have a slight nuttty-scent that quickly disappears. The effect that this serum has on my skin is like no other. My skin is very reactive but Bare keeps my skin calm and balanced throughout the day. I’ve noticed less redness and flaking and my skin no longer feels dry and oily. This is now a staple in my daily routine and cant imagine being without it! I read about Root Science in our local Diablo Magazine. After reading the story I immediately bought a bottle of Bare and starting using it day and night. Within a month my skin had a marked improvement. It had a softer texture, the red lessened and some of the spots disappeared. I also love the way it soaks into my skin within a few minutes. I now use Bare and Bright and have recommended it to my friends. LOVE IT! I have battled oily, acne prone skin my entire life. It took a leap of faith for me to put serum on my skin as I always thought it would cause a breakout. I have been using Bare, in combination with the Cleanse bar, for several years now. My skin is no longer oily, but clear and healthy… it even has a subtle glow to it. I can now go makeup free and feel confident which is a feeling I never thought I would experience. I simply love this product. I have only been using this product for four days but within those four I can already tell an immense difference in my skin. Before, I had been bouncing between face routines, trying to find ‘the one’ that actually made any difference. Most systems that I have tried only seemed to make my skin worse. This is ultimately the product that I had been missing. My skin is loving it. My skin has not felt this soft in years. It’s amazing that even within our days, my skin’s complexion has already immensely improved. I can definitely tell it is on the proper road to recovery. I will definitely recommend this highly. I recently moved to London from Los Angeles and my skin has had a VERY harsh reaction to the change of climate. I broke out in itchy eczema over my entire face, including my neck and ears. My friend who is prone to acne has had success with Root Science and told me to try it. I’m EXTREMELY particular with what I put in and on my body. The ingredients in RS Bare are pure and there are no added chemicals, which in my experience is very rare to find in “green beauty” products. After one week of using the Cleanse bar and Bare oil my inflamed skin has completely calmed down! I’m not exaggerating when I say my skin is hypersensitive to most products and weather. The deep red and dry patches on my face have disappeared and my skin feels moist and balanced again. I highly recommend this product and I’m excited to see the long term effects! I have extremely sensitive, acne prone and oily skin that somehow still manages to be dry at times. Saw some of the reviews for RS Bare defense and decided I better get the sample to make sure my skin is okay with it. First use my skin drank it up like water, especially being winter and dryer than usual, woke up to a completely moisturized skin. Absolutely no irritation. It seems to soothe out any redness I have from any break outs and haven’t had an new breakouts since. Will be purchasing the full size bottle and cannot wait to see long term results!! A beautiful light weight serum that’s been a saving grace for my environmentally damaged skin. I spend a lot of time outdoors so my skin suffers from sun spots, redness, and dry patches. I’ve been using your products for over 6 months now and can truly say it’s restored my skin back to health! Amazing products! My sensitive skin is responding unbelievably well. No more flaky skin and oily patches! My skin feels balanced and super hydrated. Love that this line is completely organic and vegan! I have severe skin sensitivity and break out very easily. After a friend recommended I try Bare I decided to do a little bit of research before trying yet another product. The fact that I could pronounce all the ingredients sold me! I’ve had amazing results and my skin is on its way to recovery. It’s been 2 months now and my skin is no longer red, itchy or irritated. My breakouts have subsided and acne scars have started to fade! I can’t wait to see the results after 2 more months! I highly recommend this to people with very sensitive skin.